Going for a walk or hike is a great way to get some exercise, some fresh air, and get your kids moving. Whether my family is at home or traveling, we usually try to get some walking or hiking in every week. For younger kids, long walks or hikes can be a challenge though and you might still want to bring along a stroller so that you can keep walking even when the shorter legs get tired. I'm sure most parents have heard the dreaded "can you carry me?" at some point! And if you're the parent of a child that isn't walking yet, then a stroller (or carrier!) is a necessity. Not all trails and walks are great for strollers, but here are 7 places in and around Vancouver where you can comfortably and easily go for a walk even if you're pushing a stroller. Third Beach in Stanley Park, Vancouver. In downtown Vancouver, there is really no better walk than Stanley Park's Seawall. The scenery of the city, mountains, and ocean, is unbeatable, and there's some great people- and dog-watching as well. The route is paved all around the park (the trails through the woods are not however), and there are lots of nice stops along the way: Vancouver Aquarium, Third Beach, Prospect Point, various playgrounds, and more. Located in North Vancouver, Lynn Headwaters Regional Park offers a smooth, level gravel-trail along the river. Just follow the lower part of the Lynn Loop trail, and you'll enjoy some nice river and forest views, without having to go into the rough with the stroller. The upper part of Lynn Loop involves stairs, rougher terrain and steeper inclines and is not for strollers. However, my 5 and 9 year old do great on that part of the trail too these days. 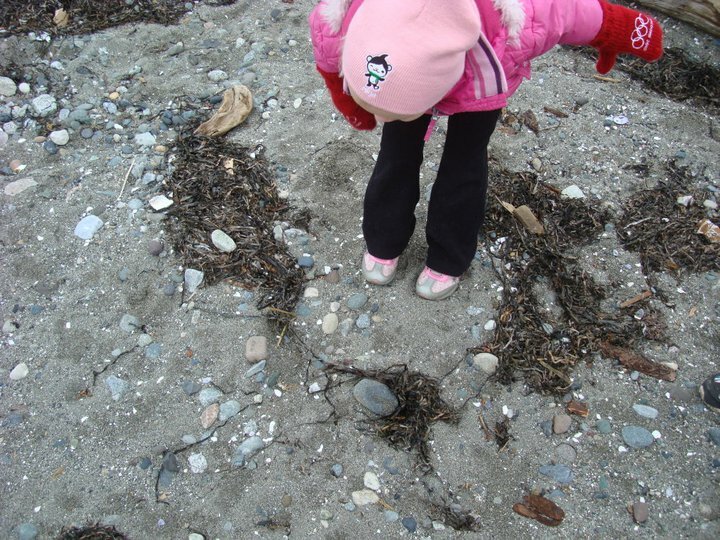 Looking at a dead crab in the sand at Crescent Beach. This wonderful stretch of beach is located in White Rock, south of Vancouver. There's a gravel trail along the beach that is perfect for strollers and for small children. The beach is great for beach-combing, digging in the sand, throwing rocks or just sitting down and having a snack. The public market on this island in the middle of downtown Vancouver, and all the other little shops and eateries here are very popular with locals and tourists. It's a great place to go shopping, or eating, or walking. There's a walkway that goes around Granville Island, mostly following the water. Part of it is boardwalk, and part of it is paved. Easy walking, and it goes right past the playground and water-park. The beach at Spanish Banks. Spanish Banks is one of the best beaches in Vancouver (I'd say Third Beach is better, but it's also smaller and more crowded), and it also has a nice, level walking trail running along it. Walking here you get a great view of the water, the ships, the north shore mountains, and downtown Vancouver. If you want to go for a longer stroll, you can keep walking past Jericho Beach at one end of Spanish Banks, and continue along the water all the way to Kitsilano Beach. This part of Richmond, has a lot of great trails and walkways and all of them are easy to walk with a stroller or small children. There's a gravel-trail that loops around Garry Point Park , or you can walk through the village and keep going to the historic part of Steveston.